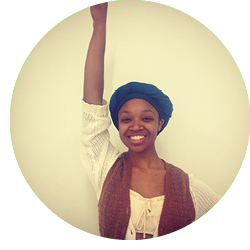 Aissatu Young is a vibrant woman with a goal to impact the world through performance art. She is currently a junior at Purchase College with a double major in Theatre Performance and Political Science. Her artistic endeavors include many forms of vocal music, writing, acting and dancing. A few of Aiisatu’s recent performances include La Piccola X in Dickstein’s adapatation of Italo Calvino’s La Distanza Della Luna in the summer of 2014. She also played the character of Nasreen/Ensemble in Naomi Iizuka’s Anonymous in fall of 2013 and Malika/Socs in Kia Corthron’s Breath Boom in fall of 2012. As a member of viBeCompany, Aissatu is very grateful for the opportunities she’s had to join forces with fellow viBe women and femmes.